Muddy Water Watch is a project designed to monitor and reduce sediment pollution in North Carolina water ways. Primarily from construction sites, poorly maintained and illegal roads, sediment pollution is the number one reason for poor water quality in North Carolina. Sediment pollution is a grave water quality concern because it smothers aquatic life, warms the water, reduces oxygen levels, destroys habitats, and clogs fish gills. This pollution is contributing to a massive decline in fish populations and increasing susceptibility to blue-green algal blooms that release toxins and impair streams from swimming, fishing and drinking. Muddy Water Watch is sponsored by the North Carolina Riverkeepers to reduce pollution and increase erosion control measures throughout the state. The French Broad Riverkeeper worked with the U.S. Forest Service and the National Forest Foundation to close 24 illegal roads in Hurricane Creek, a sub-watershed and trout stream in the Pisgah National Forest. The Riverkeeper is now looking into four additional sub-watersheds to identify potential roads to be closed in the future. The French Broad Riverkeeper is responsible for identifying issues that threaten water quality throughout the entire French Broad Watershed, however the Riverkeeper cannot monitor the entire watershed at all times. 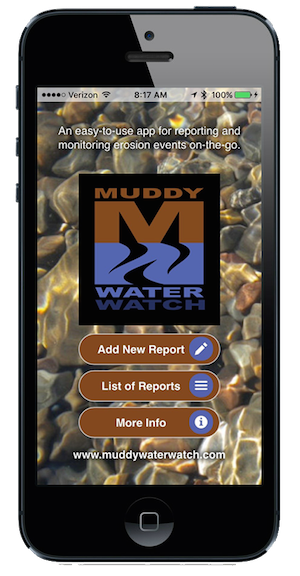 If you see construction sites or illegal roads that are causing sediment pollution directly into a river or stream, you can log onto the Muddy Water Watch app and record your findings or email the French Broad Riverkeeper Hartwell Carson at hartwell@mountaintrue.org. Muddy Water Watch, a project of MountainTrue, the French Broad Riverkeeper and the North Carolina Waterkeepers, has teamed up with Shiny Creek, an Asheville-based enterprise-class web and mobile application development company, to create a new smartphone app that makes documenting sources of dirty water easier than ever. The Muddy Water Watch app makes defending water quality in Western North Carolina easy by reporting sediment pollution. 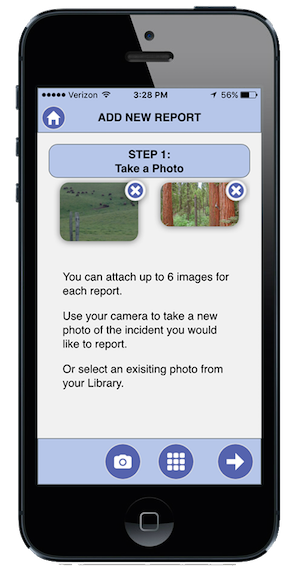 On the app, users can easily snap a photo of the pollution source, provide notes and submit a report. The report is geotagged so that it goes to the appropriate authority of the pollution site. Through Muddy Water Watch, volunteers go out hiking, biking, and driving to collect data about sources of sediment pollution. The data is used to work with the US Forest Service to repair damaged roads, culverts, and other sources of sediment to ensure these streams remain healthy. After nearly a decade of work by WNCA (now MountainTrue), 11th District Congressman Heath Schuler, and many others, the long-proposed North Shore Road along the shore of Fontana Lake was put to rest. The people of Swain County were financially compensated in lieu of the originally promised road, and pristine streams, sensitive aquatic life and public land were preserved.